The Senate and House repeal-and-replace bills that failed to pass last summer were aimed at changing the funding structure of the Medicaid program from a federal match of state spending to a combination of per-capita spending caps and state block grants. Both approaches would have tied federal Medicaid spending to a fixed growth rate, shielding the Federal government from actual healthcare cost inflation. All in, this approach would have saved the federal budget an estimated $772B – $880B over ten years, largely by shifting the accountability for Medicaid cost growth onto states. Without the federal match, states would be responsible for cost inflation above the set growth rate. State pushback to this policy, particularly from Republican governors, was a key reason for the failure of ACA repeal. As we discussed in January, full repeal of the ACA and other major entitlement reform is likely off the table for 2018 as Congress approaches the midterm elections. But even without major reform, states are feeling enormous pressure to reduce spending. Medicaid is already the largest line item on most states’ budgets, crowding out spending on other priorities. Incremental “entitlement reform,” largely coming in the form of pilot programs and waivers, is a likely near-term approach to reform Medicaid and reduce spending. Central to this strategy will be enabling state efforts to manage spending by reducing enrollment—precisely the thrust of proposed Medicaid work requirements. Medicaid work requirements and other restrictions on enrollment are consistent with core Republican beliefs about the purpose of programs like Medicaid. In terms long used by Paul Ryan and others, the safety net should not be a “hammock that lulls able-bodied people into lives of complacency and dependency”. The waivers approved in Kentucky, Indiana, and Arkansas, as well as those pending for seven other states, require eligible, able-bodied, non-elderly adults to work at least part time, to be actively seeking a job, or to participate in community service. Those who do not comply would lose eligibility or benefits. Logically, cutting coverage for non-working beneficiaries should decrease Medicaid spending. But two issues raise doubts about the magnitude of potential savings. First, the eligible population that would likely be subject to work requirements is small. 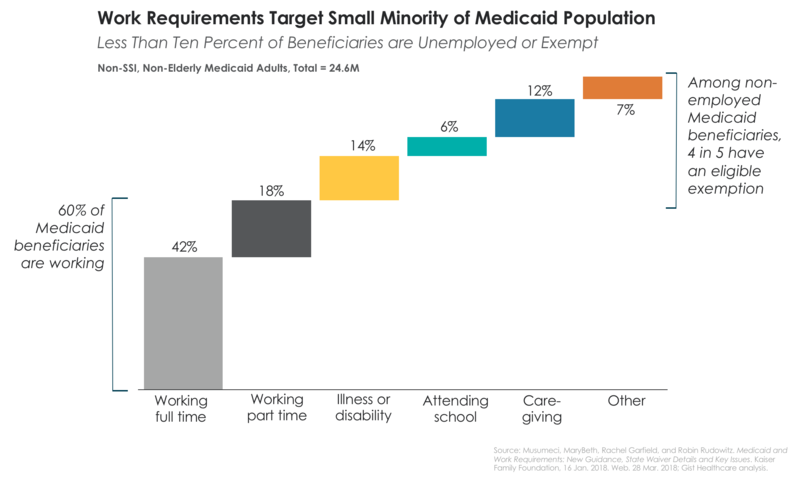 Research from the Kaiser Family Foundation estimates only one in five non-working Medicaid enrollees—1.7M nationwide—will fall under work requirements once exemptions are taken into account. Second, infrastructure costs for administering work requirements could be high. Kentucky, the first state to receive waiver approval, expects to spend an estimated $374M to launch the program across the next two years. While state officials estimate work requirements could move 100,000 beneficiaries out of the program in the first five years, it could take several years for the state to even recoup the infrastructure investment. Specific benefit design and current eligibility levels will play a critical role in state-by-state impact. Some proposed work requirements in states with low income thresholds for Medicaid eligibility have the potential to create perverse incentives, as working even part-time at minimum wage might raise income above the eligibility threshold. However, low-income jobs are less likely to come with health benefits. A proposal under consideration in Alabama would extend work requirements to some single parents of young children, but provide no access or support for childcare. While work requirements have garnered the most attention in the media, they are just one of several types of Medicaid waivers that might usher in sweeping changes to the program. More than a dozen states have implemented or are pursuing consumer-focused plan design and premium payments for Medicaid enrollees. Wisconsin is poised to be the first state to require drug testing for eligibility. And at least five states are pursuing lifetime limits for coverage. Each of these policies not only creates new criteria to limit eligibility, but also would require beneficiaries covered under these policies to document and verify their status or compliance. The administrative processes can be complex, often requiring Internet access or in-person visits to enrollment centers during working hours. These hurdles could cause beneficiaries with legitimate exemptions to lose coverage, amplifying the impact of the policy beyond the target population. Early results from “Healthy Indiana Plan 2.0,” which was architected by Seema Verma prior to her elevation to CMS Administrator, point to the impact administrative burdens can have on coverage. Launched in 2015 as the vehicle to expand Medicaid in Indiana, and recently renewed through 2020, the program requires enrollees to maintain an HSA-like “Power Account” to cover cost-sharing requirements. While the state funds the account, individuals are also required to pay a small, monthly, income-adjusted premium or risk losing benefits. Recent analysis of the program showed that over half of Indiana Medicaid beneficiaries failed to make payments or activate the account, resulting in over 350,000 eligible individuals losing coverage or having their benefits curtailed. Of those leaving the program, half became uninsured. Confusion about the payment process was the most commonly-cited reason for not making payments, after affordability of the premium. Healthy Indiana 2.0 also provides a window into the impact of eligibility changes on providers. Given that the program enabled Indiana to expand Medicaid under the ACA, 40 percent of hospitals reported a decline in uncompensated care. We would expect more states with Republican-majority legislatures to use work requirements and consumer benefit design as a means to defuse the politics of Medicaid expansion—as is being considered currently in Virginia. For providers in these states, the net impact could be positive. However, if eligibility changes are applied without concomitant coverage expansion, health systems will almost surely see uncompensated care and bad debt rise as patients lose benefits. Some providers in Indiana are also helping Medicaid patients navigate the administrative complexity of Healthy Indiana 2.0. Health systems we have worked with in the Hoosier state have started foundations or other vehicles to help enrollees establish “Power Accounts,” and are even paying premiums on behalf of enrollees, where legally permissible. As these types of programs move forward in other states, we would advise providers to take an active role in assisting patients in navigating the necessary steps to preserve Medicaid coverage. The impact of work requirements on health status is unclear. Kaiser Family Foundation found “while there is some research showing that increased income or employment is associated with improved health outcomes and mortality, it is difficult to determine the direction of causation—whether income and work lead to better health, or whether better health facilitates income and work.” Providers are likely best positioned to ensure that these kinds of policy changes do not negatively impact the health of patients. Ensuring that the most vulnerable patients have access to care as Medicaid programs continue to evolve will be central to the performance of health systems’ community missions.